George Hedrick was born in 1877. He was the second child of Henry H. and Anna (Reiff) Hedrick. 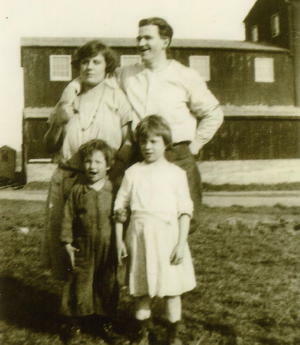 George and Rose Malinda lived in a converted barn in Lansdale, PA. The barn is shown in the background of the picture below. They had an apartment in the upstairs and George kept the wagons and other equipment he used in his business in the lower section of the barn. The barn was located across Green St. from the Lansdale Cemetery. George died in 1942 and is buried in St. Peters Union Cemetery in Hilltown Township, Bucks County, PA.
George is descended from John Peter Hedrich who was born in 1775 in Richland Township, Bucks County, PA. His father, Henry H., was the son of Henry and Elizabeth (Heistand) Hedrick who are buried at Line Lexington Mennonite Cemetery in Bucks County. Henry H. and Anna are also buried at St. Peters Union Cemetery. Henry H. Hedrick was first married to Mary Reiff (Anna's sister). Mary died in 1872 shortly after the birth of their second child. Levi M. Siegfried was born in 1875. He was the fifth child of ten born to William C. and Mary Tyson (Mills) Siegfried. Mary Mills was the daughter of Solomon and Hanna B. (Tyson) Mills of Chester County, PA. She was born in 1849 and died in 1927. She is buried in Morris Cemetery in Phoenixville, PA. William was the son of Henry and Margaret Rebecca (Christman) Siegfried. He was born in 1841 at Christman's Mill in Hereford Township, Berks County, PA. He died in 1902 and is buried at Keeler's Cemetery in Montgomery County, PA. 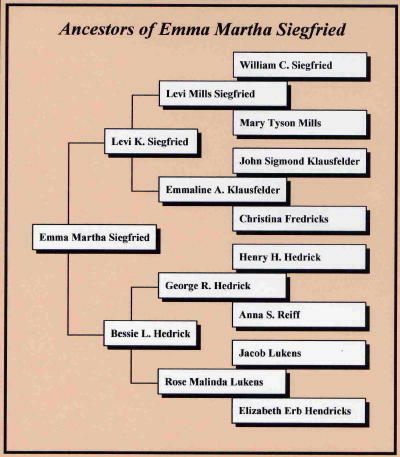 The Siegfried family was one of the first, if not the first, non-indian family to settle in the Maxatawny area of Berks County near present day Kutztown, PA. Sometime in the 1720 they moved to this area of Berks County and settled on a large tract of land that became known as Siegfried's Dale. The founder of the family in Berks County was Johannes Siegfried who was born around 1692 and died around the end of 1747. Among his sons were Joseph who married Anna Maria Romig, and through their son Henrich, is the ancestor of William and Levi Siegfried. Another son of Joseph, John, married Mary Catherine Levan. John and Mary migrated to Allen Township in Northampton County (later Lehigh) where John owned a tavern and store and operated a ferry at what is known as Siegfried's Bridge on the Lehigh River. John was a friend of George Washington and raised the first two battalions of Northampton County for Washington. He was commissioned a colonel and commanded the third battalion in 1777. Rose Malinda Lukens was the fourth of five children born to Jacob and Elizabeth Erb (Hendricks) Lukens. She was born in 1879 and died in 1931. She is buried in Lansdale Cemetery. Jacob Lukens was the son of Enos T., Jr. and Susan (Ruth) Lukens. Enos Lukens was descended from two of the oldest German families in Southeast Pennsylvania. His parents, Enos T. Lukens, Sr. and Ann Tennis, were descendants of two of the original 13 families to settle in Germantown, PA near Philadelphia. The families of Jan Lukens (orginially Lucken) and Abraham Tennis (orginally Tunes) came to Pennsylvania in 1683 and helped Daniel Pastorius settle Germantown. Around 1710, Jan and Abraham bought 1000 acres in Towamencin Township, Montgomery County. The land was divided equally amongst the two families. There still exists the small Lukens/Tennis family cemetery, in that township, which contains the burials of some of the earliest family members. The Siegfried family in 1925 shortly before the death of Levi K. Siegfried. Clockwise from left rear - Bessie Hedrick/Siegfried, Levi Siegfried, Emma Siegfried/Ziegler and Horace Siegfried. The picture was taken in Lansdale, PA across Green St. from Lansdale Cemetery. Emmaline Klausfelder was the only child of John Sigmond ("Sig") and Christina (Fredricks) Klausfelder. Sig and Christina were born in Germany and migrated to America around 1855. Sig and his parents were born in Bavaria. Christina was born in Wurtemberg. Her father was born in Baden and her mother was born in Wurtemberg. Emmaline was born some 12 years later. In 1880 Sig was farming land in Gwynedd Township, Montgomery County, PA. Emmaline died shortly after her 100th birthday in early 1968. She is buried in White Marsh Cemetery in White Marsh, PA. According to a newspaper article published on the occasion of her 100th birthday, the family farm was located on land then (1967) owned by Merck, Sharp and Dohme in West Point. Emmaline attributed her long life and good health to hard work, exercise and wholesome food. She would walk many miles to Sunday School and Church when she was young. Following the death of her first husband, Levi K. Siegfried, Bessie Siegfried married Abraham T. (Abie) Wambold. Abie was the fourth child of six born to Owen and Mary Ann (Scheetz) Wambold. He was born in 1899 in Springfield Township, Bucks County, PA. Abie died in 1965 and is buried in Limeville United Methodist Cemetery in Lancaster County, PA.
Owen was the son of James and Catherine (unknown) Wambold. James was born sometime between 1822 and 1824 according to the census from 1850 through 1880. I have not been able to determine who James' parents were but I am presuming that he was probably born in Rockhill Township, Bucks County, PA. and is descended from one of the many Wambold families that lived in Bucks County in the early 1800s. The Wambolds remain one of my few roadblocks.